Euan Glen was ordained and inducted as minister of the linked charge of Cluny and Monymusk in 1992. He is married to Anne, and they have one son, Andrew. Euan was born and raised in Dundee. On leaving school he studied at Dundee Institute of Technology (now Abertay University) where he gained a B.Sc in Quantity Surveying. He began his professional career with D I Burchell & Sons in Dundee. During this time he felt called to the ministry and returned to university – this time to study for a BD in Aberdeen University. He completed his training for the ministry as an assistant minister at Rubislaw Church in Aberdeen, where he worked for almost two years before moving to Monymusk. In his spare time Euan is a passionate supporter of Dundee Football Club, following the trials and tribulations of the boys in blue. He enjoys watching most sports, and intends to return to the golf course this year where he is a member of Alford Golf Club. He also enjoys watching television and following political programmes, both factual and fiction. The Minister’s Day Off is Monday. The minister’s visible role is to preach at Sunday worship, and conduct baptisms, weddings and funerals in the parishes of Cluny and Monymusk. 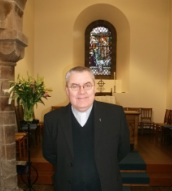 He is Moderator of both Monymusk and Cluny Kirk sessions, Chaplain to Monymusk and Cluny Primary Schools and Alford Academy, and Clerk to Gordon Presbytery . In May 2012 he was a commissioner to the General Assembly which he will be attending again in 2016. As parish minister he attends meetings and carries out the administration and planning for both congregations. He is assisted as required by members of the church committees and is available to provide pastoral support at any time to anyone in need. To request a hospital visit for yourself or a relative or neighbour, please contact Euan. Hospitals are no longer able to inform ministers when their parishioners are admitted. If you would like to arrange a baptism, thanksgiving service, wedding or funeral in Monymusk Church Euan will arrange to meet with you to discuss your plans. Euan visits Monymusk Primary school every month to conduct assemblies and visit classrooms. He takes monthly assemblies in Cluny Primary school. Euan takes assemblies and works with sixth year pupils at Alford Academy where he is part of a chaplaincy team which also includes John Cook, minister of Howe Trinity, and Elspeth McKay minister of Echt linked with Midmar. Euan is ‘church lawyer’ for the 27 congregations of Gordon Presbytery. He advises on legal matters, listens to concerns from ministers and members of congregations, maintains all the Presbytery records, and is a link between the central church organisation and local congregations. He serves on the Business Committee and is the Editor of the Presbytery year book. As Clerk he is an ex officio member of all other committees. Euan, along with representatives from the 2 congregations, is a member of the steering group which meets 4 times per year to discuss ways in which the congregations can come together to share in worship and mission activities, and to plan events. Since 2014 the area group has ceased to work and it is hoped that in the future can be restarted. Once per month Euan joins colleagues from other local congregations along with clergy from the Episcopal and Roman Catholic churches. These ministers’ fraternal meetings, which take place in different manses, give the clergy a chance to chat and enjoy fellowship. They discuss the work of their congregations, share stories and support each other. Euan is a member of a local ministers’ book club. Being part of this group has encouraged a broader understanding of theology, and directed him to books he would not normally have chosen for himself.